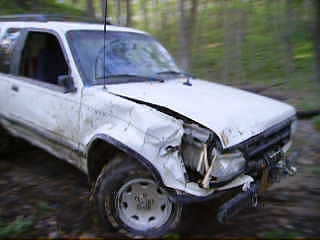 My wife, Patty, has never gone off-roading and on the evening of 19th April 2006, Andy, Dave and I took her on a trip to Coal Creek. Unfortunately, this was also the day we did more damage to "The Ho" than on any other trip so far. Going up a steep hill the driver's side front suspension spring decided to jump out of its top bracket. The trolley jack we carry around with us couldn't be raise the body high enough for us to lift the bracket over the spring but Andy came up with the brilliant idea of lifting the car using the spare tyre. Dave and Andy using the spare wheel to lift "The Ho"
Shortly after, driving down a steepish hill the track divides to go round a pair of trees. Due to the inch of rain we'd had the previous night which made the track slippery, bad driving and bad luck I managed to crash the front of "The Ho" straight into the two trees. 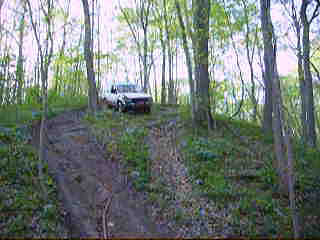 Because the hill was steep and slippery I couldn't reverse back and so we had to use the winch to drag the front of "The Ho" off of the trees. Unfortunately, this caused quite a bit of damage to the passenger side front wing. Once off of the trees everyone else got out and I tried to steer the vehicle back onto the track. My digital camera can take short, poor quality video and the following images are taken from that using VirtualDub. As both doors got a bit dented neither electric window works properly. We should be able to get them working again by removing the inner panel and pushing the steel back out. 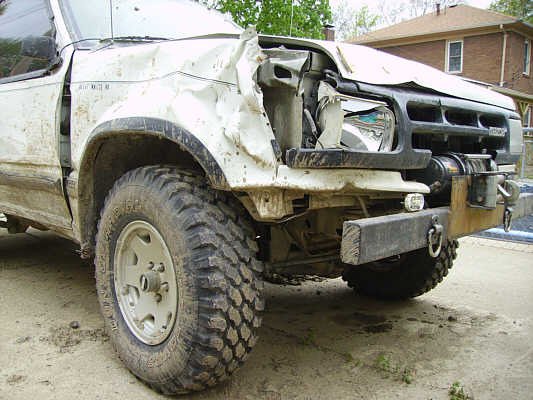 A new headlight costs around $50, a new sidelight would cost around $15 - if there was anything left to attach it to. A new wing costs around $70, a new grille costs around $100. A new hood costs around $130. A total of around $350. None of which we'll be getting unless we can find them exceptionally cheap. We may be able to do something involving duct tape with the headlight though.